We build pyramid panel double doors to your unique needs and specifications. 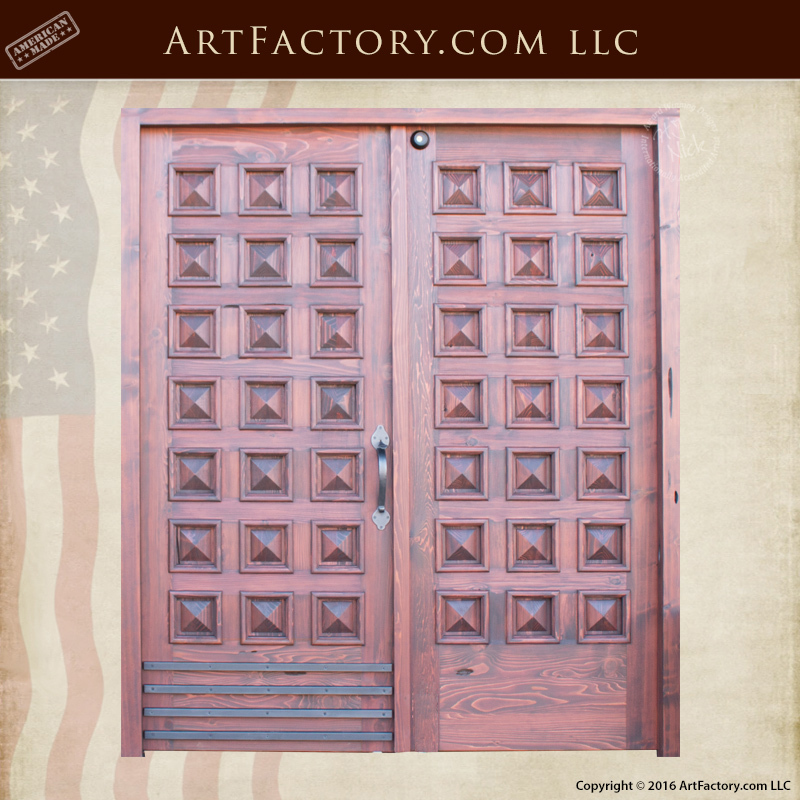 These entrance doors are hand built from thick, naturally air dried, solid, American timber. Every door that comes out of our factory is hand hewn with mortise and tenon joinery. This type of construction makes for an entrance door that is built to last. That is why our doors are never glued together, or built using any type of fast or mass production process. As a special additional features, these pyramid panel double doors as pictured. feature a remotely operated, electric entry system. A remotely opened mortise type deadbolt lock, and automatic electric hinges allow the door to be opened remotely. This type of remote system is ideal for a country club, community center entrance, or any high traffic entrance that needs to remain locked. This custom wooden door features pyramid panes and wrought iron hardware that is hand forged by our master blacksmiths. We build door hardware exclusively from pure wrought iron that is forged using fire, hammer, and anvil. Furthermore, all hardware is hand patinated at over 1000 degrees Fahrenheit, to infuse the iron oxide patina to the metal. This process makes for a finish that will last for generations with little or no maintenance. Our expert craftsmen ensure that the style you seek is what you'll receive, and we guarantee our exterior and interior doors will stand the test of time. The doors as pictured is finished with a hand applied walnut finish. All of our stains are added using a detailed, multi step, hand rubbing process that blends the stain into the grain of the wood. This makes for a long lasting finish that won't peel, flake, or crack like painted on finishes. Not only that, but every product is build under the supervision of world renowned artist H.J. Nick, and signed and certified as meeting world class fine art standards. This type of certification ensures that your product is of investment quality, with future appreciable value in antiquity. Pyramid panes are found to have been popular throughout design history. The multiple panels feature a raised point in the middle, creating a classic, symmetrical design. Our architects build each door to historically correct specifications. We build doors today, the same way we did all the way back in 1913. Most importantly, every product is 100% American made. Our craftsmen are experts in adding the fine details that make our exterior and interior doors really stand out.